Other Common Names: Spotted St. John’s wort, hypericum, klamath weed, goat weed, touch-and-heal, rosin rose. Habitat: St. John’s wort can be found growing in sunny, or partially shaded, areas throughout the United States and Canada. It prefers the dry, gravelly soil along roadsides. It is easy to grow from seed or root division in spring or autumn in well-drained soils. 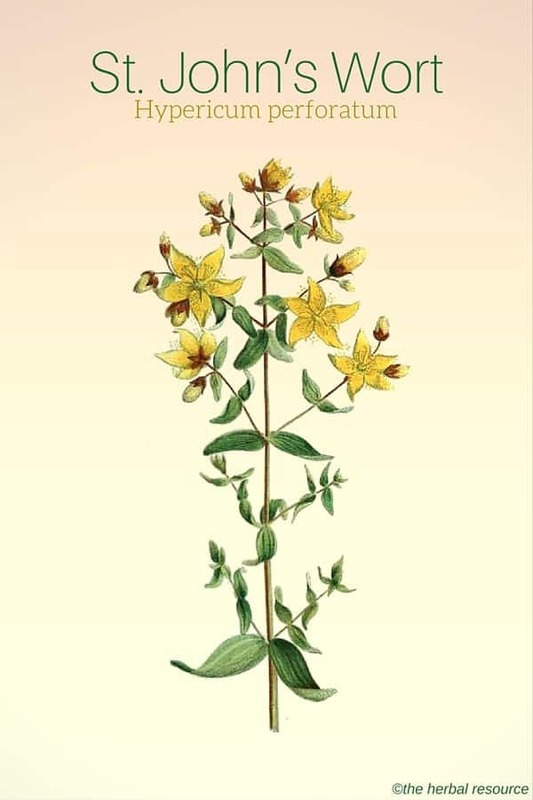 Plant Description: St. John’s wort can grow up to a height of 1 to 3 feet from a branched, woody root system, the stems are round and erect, branching at the leaf axis. The stems are a dark red at the base and covered with dark red dots at the branches. The smooth, light green, oblong leaves are covered with small transparent oil glands that look like holes. The flowers have black-rimmed, yellow petals with a center covered by many stamens, giving it a furry appearance. A three-celled capsule containing small, dark brown seeds makes up the fruit of this herb. The flowers bloom from June to September and can be harvested and dried for future use. Plant Parts Used: The flowers and the leaves are harvested and used for medicinal purposes. 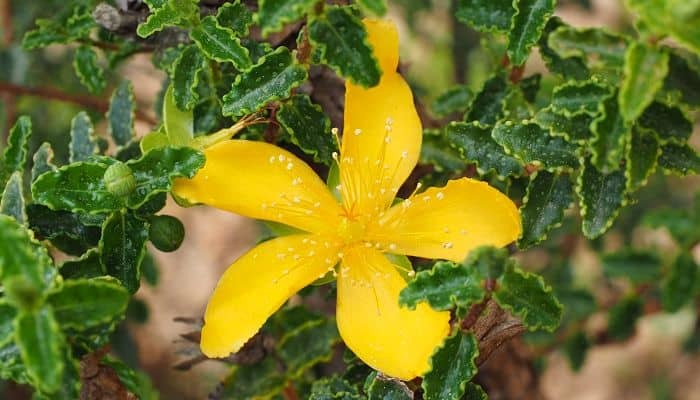 In ancient times, St. John’s wort was used as a sedative and to treat malaria. It was also used as a balm for wounds, burns and insect bites. Today it is used to treat nervous conditions such as depression, anxiety, and some sleep disorders. St. John’s wort is one of the most commonly used herbal remedy for depression. It is a prescribed medicine in Germany and Ireland, but is still available over the counter, as an herbal remedy, in many countries, including the United States. Research has shown support for its effects on mild to moderate depression, but, severe depression (especially with suicidal thoughts) should be treated by a physician. This herb is also reported to have a sedative and pain reducing the effect. It has been used as a remedy for sciatica and rheumatic pain by some. St. John’s wort has been reported to have antiviral and antibacterial properties. Its anti-inflammatory properties make it useful in healing wounds and burns. This herb has shown preliminary promise as a treatment for alcoholism as well. Some researchers are looking at the possibility of St. John’s wort in treating HIV (the virus that leads to AIDS.) The problem they are finding is that it may counteract with the medications used currently to fight the symptoms and lessen their effectiveness. Seasonal affective disorder (SAD) has also been treated with some success using St. John’s wort. It has been used in children to control bed-wetting, mild depression, as a topical agent for the relief of pain from skin infections such as dermatitis, and in drops for ear pain associated with an ear infection. A mixture of ginkgo biloba, rosemary, and St.John’s wort has shown promise in treating brain inflammation and swelling and the symptoms associated with the recovery from this condition. St. John’s wort is available in many forms. These include tablets, capsules, tinctures, teas, and oil-based creams. It can also be found in chopped or powdered form. For the best guarantee of quality, it is important to find products standardized to contain 0.3% hypercin. Since this product is not regulated it is important to seek reputable brands. 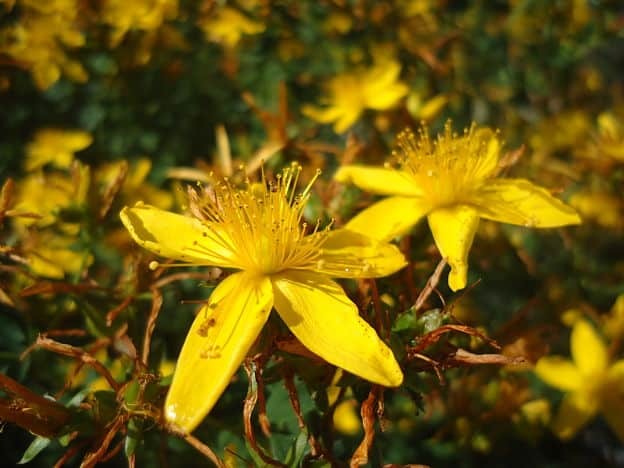 St. John’s wort does show value in helping those affected by mild to moderate depression, and when taken under the supervision of a herbalist or physician it is relatively safe. There are some mild side effects associated with the use of this herb. These include upset stomach, skin rash, fatigue, restlessness, headache, dry mouth, dizziness, and occasionally a sensitivity to sunlight. St. John’s wort does have a long list of possible drug interactions. 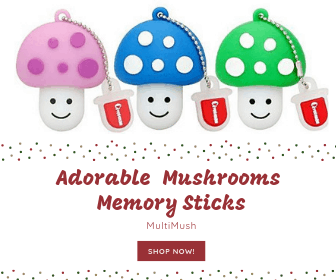 Due to its ability to metabolize some of these medications rapidly, they may pass through the system quickly causing ineffectiveness or hyperstimulation. Anyone taking medications should consult their physician or pharmacist before adding this herb to their regimen. The following medications are especially dangerous when mixed with St. John’s wort: Antidepressants, Digoxin, Immunosuppressive medications, protease inhibitors (such as Indinavir), Loperamide, Oral contraceptives, Reserpine, Theophylline, Warfarin, epilepsy medications, and medications used in surgery.